Back Flip Bags are available in any color, size and thickness. Product is placed in the bag and top folds like a “sandwich bag”. Commonly used for quick and easy packaging allowing person to feel the product inside the bag. 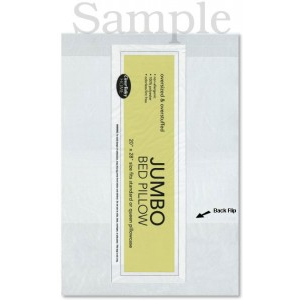 These bags are often used by manufacturers of apparel, bedding, and pillows. Used to contain apparel without permanently sealing it – those situations when customers want to feel the product as part of the sales process. This is a easy-close bag without having to seal the bag.